We will obtain the City of Winnipeg building permit for you and follow all applicable requirements. City zoning and construction requirements for open non-sheltered wood decks for residential dwellings can be seen HERE. We can safely remove and properly dispose of any old structures. These include decks, fences, sheds, etc. Please inquire if you have something else in mind that needs to be removed. We will also obtain the mandatory utility clearances if preforming any underground work. These include, but are not limited to; Hydro, MTS and Shaw. We value everyone’s safety and respect your living space. Therefore we will maintain a safe/clean job site throughout the duration of the project and we will keep you informed of project details on a daily basis. Surface pads are acceptable if the underside of the joists is less than 51″ high. However, they will require landscaping fabric and gravel to prepare the area. Ground screws are an indispensable solution if the underside of the joist is greater than 51″, but recommended at any height, and ensure your deck will not shift with the changing seasons. For more information on ground screw specifications please CLICK HERE. We use a minimum of two ply 2x8 beams and 2x8 joists on 16” centers. However, each project will be individually accessed in order to ensure that it will pass building inspection. Note that single beam decks require a ledger board to be lag bolted to the house. Appropriate joist hangers and galvanized hanger nails will be utilized when there is a ledger board. 2x6 top decking parallel to the house is most commonly used. Special situations may require the boards to run perpendicular. If this is the case, we must grade the deck to make sure water will run away from the house. For a unique design; boards can be installed diagonally, fish-bone and several other configurations. Regardless which direction the boards are running we will use double joists on each end of the deck during framing in order to fasten a 2x6 “perimeter” board. The result will encapsulate the entire surface of the deck producing a 1″ overhang and a finished edge all the way around, keeping the deck uniform with the finish edge on the stair treads. We hand pick each board and if you are not satisfied with the appearance of any we will swap it out with a new one. Note that we will not just “flip-over” any unwanted boards as each board has a “cup” that should face down to prevent water from accumulating on top of the boards. Last but not least; we fasten all top boards down with 3″ ceramic coated screws. 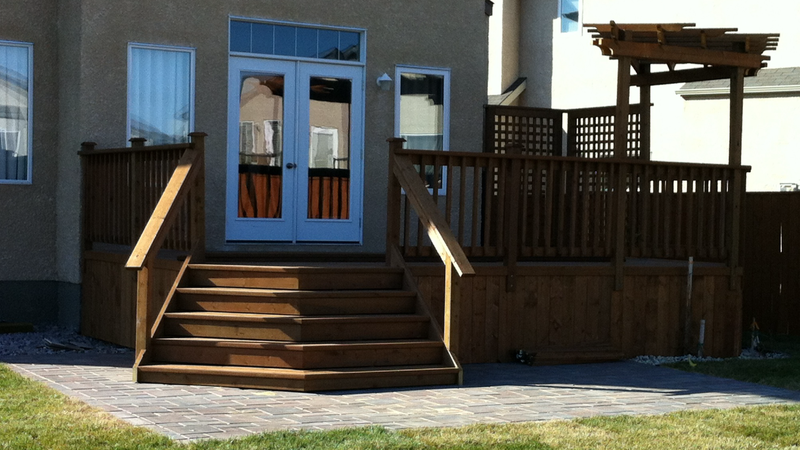 Any deck over 24″ high requires a minimum of 36″ high railing. Any deck over 72” high requires a minimum of 42” high railing. Wood or aluminum ballausters are most commonly used but several others are available. Which ever ballausters that you choose it is mandatory that that they measure less than 4″ spacing between them. Other railing options include; privacy screening, built-in bench seating and planters. Regal Railing is recommended when using composite decking. Building code requires the rise of each step be unifrom measuring between 6″ and 8″ in height. Following these guidelines we carefully cut our own stringers with precision to ensure that you can safely travel up and down your stairs with ease. Closed in risers produce a 1” overhang consistent with the perimeter board. Optional LED deck lighting available upon request. optional access door for extra storage under the deck.